Data from the BLS Job Openings and Labor Turnover Survey (JOLTS), released Friday, indicate that construction job openings fell back in February but remain higher on a year-over-year basis, consistent with the ongoing challenge of the availability of labor for builders. The number of open construction jobs in the US totalled 286,000 for the month, compared to 198,000 in February 2018. The open position rate (job openings as a percentage of total employment plus current job openings) declined to 3.7% in February (from 4% in January), but stands higher compared to 2.7% a year ago. The overall trend for open construction jobs has been increasing since the end of the Great Recession. This matches survey data revealing that access to labor remains a top business challenge for builders. However, more modest growth rates for housing construction for 2019 and 2020 are likely to place downward pressure on construction job openings in future data releases. 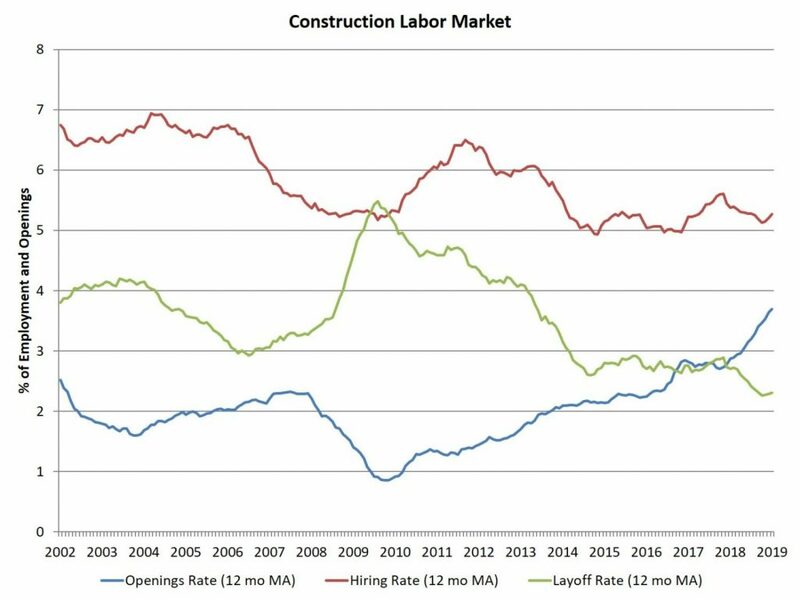 That is, 2019 may be the year in which the job openings rate for construction levels off, albeit at elevated levels. This would nonetheless be a continuing sign for the need for additional worker recruitment into the industry. The construction sector hiring rate, as measured on a twelve-month moving average basis, dipped to 5.2% in February. The twelve-month moving average for layoffs remained at 2.3%. However, as a sign of increasing labor market churn, the quits rate for construction sector jobs remained at a relatively elevated 2.5% rate, compared 2.1% a year ago.